New Ibotta Rebate: Cheap Pasta! 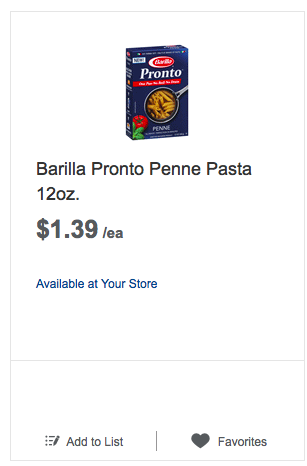 Meijer, Target and Walmart sell's Barilla Pronto for $1.39 each! UPDATED: If you have Mobisave, this is now a MONEYMAKER!!! I just noticed a new Ibotta rebate, which will help me toward's my August bonus! If you have mobisave the Barilla pasta reset for me today (8/31) and it is a moneymaker for me! There are coupon's out there if you want more! Make's it $0.89 each wyb 4 with coupon and after Ibotta Rebate! Make's it $0.62 each wyb 2 with coupon and after Ibotta Rebate!